Microscopic images taken by two Western College of Veterinary Medicine (WCVM) students have earned the coveted cover spots on two different scientific journals. WCVM graduate student Sonu Subudhi’s research paper, “Isolation, characterization and prevalence of a novel gammaherpesvirus in Eptesicus fuscus, the North American big brown bat,” was published in the March 2018 issue of Virology. An image from his research was also featured on the issue’s cover. The image shows an electron micrograph of a novel bat gammaherpesvirus, budding out from big brown bat kidney cells. This herpesvirus remains mostly inactive in North American bats, but they can sometimes shed the virus and pass it on to other animals. In his research work, Subudhi is investigating the blood of these bats to determine if certain environmental, reproductive or nutritional stressors can cause the virus to reactivate. This work will show researchers how they could reduce bat stressors and prevent passing it on to other animals, or at least predict when this might happen. Under Dr. Vikram Misra’s supervision, Subudhi is working on his PhD degree in the WCVM’s Department of Veterinary Microbiology and expects to complete the program in 2019. He then hopes to begin a residency in infectious diseases at the B.C. Centre for Disease Control. Crystalyn Legg-St. Pierre, a 2017 graduate of the WCVM, published her research titled “Insulinotropic nucleobindin-2/nesfatin-1 is dynamically expressed in the haemochorial mouse and human placenta,” in the August 2017 issue of Reproduction, Fertility and Development. An image from her research was also featured on the issue’s cover. The image shows insulinotrophic nuclebindin-2/nesfatin-1 — the protein under investigation — in the mammalian placenta. Legg-St. Pierre completed the highlighted work while she was a summer research student in Dr. Daniel MacPhee’s laboratory. Her research focused on a protein that may have a role in glucose transport and nutrient sensing in the placenta during pregnancy. It may also have implications for the baby and mother. Legg-St. Pierre will return to the WCVM in July 2018 to begin a combined graduate program and residency in anesthesiology. Subudhi S, Rapin N, Dorville N, Hill JE, Town J. Willis CKR, Bollinger TK, Misra V. “Isolation, characterization and prevalence of a novel Gammaherpesvirus in Eptesicus fuscus, the North American big brown bat." Mar. 2018. Virology. 516:227-238. Legg-St Pierre CB, Mackova M, Miskiewicz EI, Hemmings DG Unniappan S, MacPhee DJ. “Insulinotropic nucleobindin-2/nesfatin-1 is dynamically expressed in the haemochorial mouse and human placenta.” Aug. 2017. 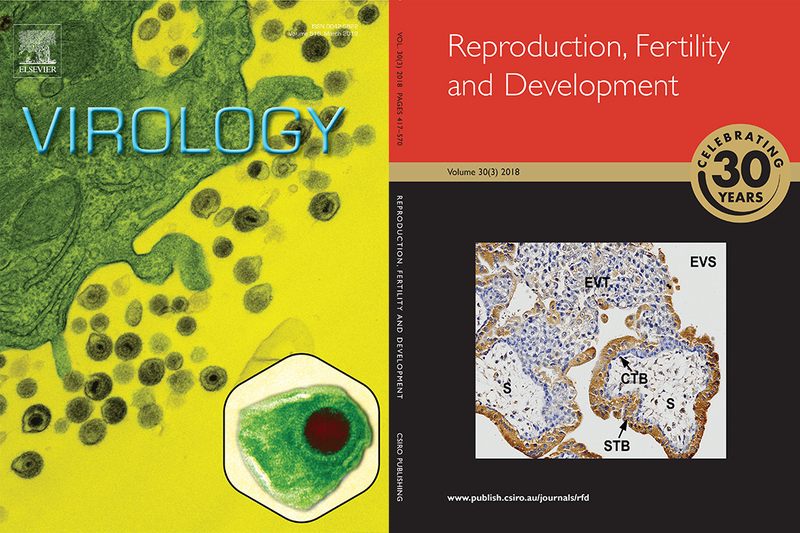 Reproduction, Fertility and Development. 30:519-532.